It was the biggest night in the UK film calendar, as the British Academy Film Awards were handed out at the Royal Opera House in Covent Garden. Richard Linklater's Boyhood emerged as the big winner, taking Film, Director and Supporting Actress. Pictured above is the movie's attending cast and crew, plus Tom Cruise, who presented Best Film. Alas, Linklater was absent due to the Directors Guild Awards the previous night in Los Angeles. The other big winner was Wes Anderson's The Grand Budapest Hotel, which took home five Baftas: Original Screenplay, Score, Production Design, Costumes and Make-up & Hair. Other triple winners were The Theory of Everything (British Film, Actor, Adapted Screenplay) and Whiplash (Supporting Actor, Editing and Sound). 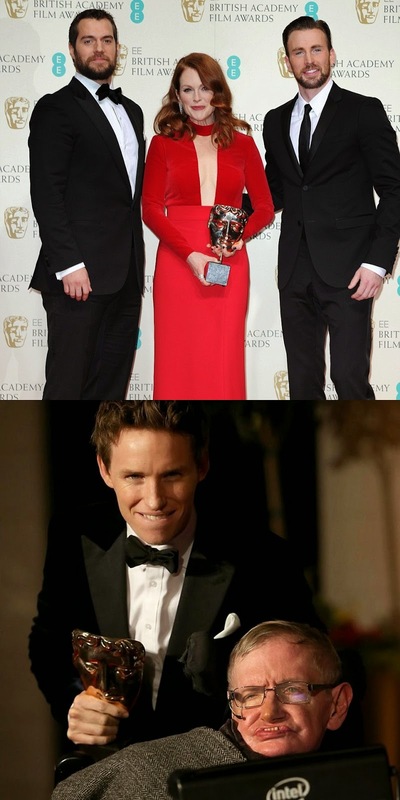 Pictured at the right is Best Actress winner Julianne Moore with presenters Henry Cavill and Chris Evans, and Best Actor winner Eddie Redmayne with the person he played in the film, Stephen Hawking. Bafta is always a strange one, because the BBC refuses to broadcast it live, waiting a few hours and chopping it down to two hours to show later at night - meaning there are several "awards presented earlier" bits in the closing credits. This butchers the ceremony's flow and momentum, leaving it feeling oddly dry and dull. It doesn't help that Stephen Fry has been hosting just a bit too long - he's still timely and pithy, but offers nothing remotely new from year to year. As for other awards, Bafta usually gets to present at least one worthy winner that Oscar ignored, and Sunday night's was The Lego Movie, which won Animated Feature. It was also great to see Ida win Foreign-Language Film and Pride's writer and producer win the Outstanding Debut award. 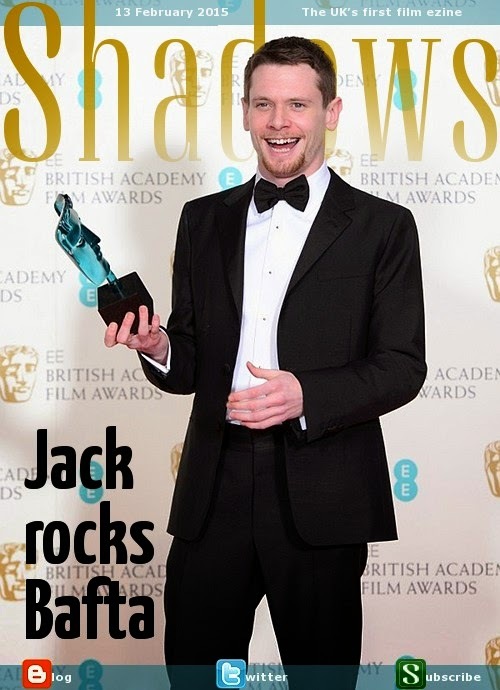 Finally, it was no surprise that Jack O'Connell won the Rising Star Award - he's had an awesome year with Starred Up, '71, Unbroken and even 300: Rise of an Empire. Meanwhile, Screenings this past week were all rather low-key titles, including the strikingly involving transgender comedy-drama Boy Meets Girl, the enjoyable British indie alien invasion adventure Robot Overlords, the astonishing Ukrainian deaf-gang drama The Tribe and the eye-opening narrative documentary The Man Who Saved the World. I also got a chance to see Blade Runner: The Final Cut on a big screen for the first time in advance of its re-release in a couple of months. This coming week's collection will include the event movie Fifty Shades of Grey, Will Smith in Focus, Chris Hemsworth in Blackhat, Francois Ozon's The New Girlfriend, the Kiwi drama The Dark Horse and the acclaimed doc Dreamcatcher.